Elevator doors at the Spalding Building, Portland, Oregon (2012). Photo (cc) Another Believer. 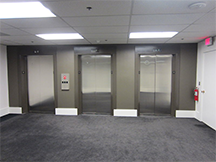 The elevator doors closed, and Ron and Caroline had a minute or two to themselves. Angry, Ron could wait no longer. "Caroline. Why are you always telling us what to read? I'm so busy you just make me feel bad I don't read much." Now Caroline felt bad. "I'm sorry…I just got so inspired by this book. It's so profound." The elevator came to a stop, the doors opened, and they stepped into the lobby. "OK," he said. "So what is the eighth habit?" Caroline smiled, "Writing bestsellers." They both laughed. With humor, Caroline turned shared tension into shared laughter. Humor helps us through the tight spots. But what can you do if you're just not funny? Here's a concise guide for the humor-impaired. If you ever laugh at yourself, you're funny. Accept it. All you need to learn is how to let others in on it. Jokes probably don't work for you — not yet anyway. Instead, build your humor from whatever is in the air. Nearly everything at work is laughable if you look at it right. Wait for the right opportunity — a dark moment or a silent pause in a tense situation. You have to get there before anybody else, and before the conversation moves on. Surprises work. The lead-in to this essay contains an example: If you're already skilled, I can't help you, but if you're humor-impaired, I can't help you either. The "but" is key. One reliable way to violate expectations is to use a series of three items. Use the first two to establish a pattern, and then break it with the third. That's why so many jokes have three people in a boat, or three people going into a bar. These are likely to offend, especially if the attributes are negative or can't be changed, like height, weight, or stupidity. Make fun of yourself in a way that everyone can connect with. Use this sparingly — overdoing it can be bad for your career. Unless you're Rodney Dangerfield. If people know that you're humor-impaired, they don't expect you to be funny. Until they do, they'll assume that your dry humor and sarcasm are serious. Turn the idea onto itself, possibly at a deeper or shallower level. This is what Caroline did above. See "When It Really Counts, Be Positive," Point Lookout for March 13, 2002, for another example. Would you like to see your comments posted here? rbrenbsMDybUMsieLQFhrner@ChacOcLvYiNQsEUOFQWZoCanyon.comSend me your comments by email, or by Web form. In high performance teams, cooperative behavior is a given. But in the experience of many, truly cooperative behavior is so rare that they believe that something fundamental is at work — that cooperative behavior requires surrendering the self, which most people are unwilling to do. It's another teamwork myth. When some team members hang back, declining to show initiative, we tend to overlook the possibility that their behavior is a response to something happening within or around the team. Too often we hold responsible the person who's hanging back. What other explanations are possible? I offer email and telephone coaching at both corporate and individual rates. Contact Rick for details at rbrenXqHLBPHnCztJNbtPner@ChacQXLrUSFnijtWZbopoCanyon.com or (650) 787-6475, or toll-free in the continental US at (866) 378-5470.